I love your blog, but don't see any posts on exercise equipment. My husband and I live in a 1,000sf condo so we don't have equipment like treadmills and elliptical trainers, but we have assorted small items like weights and balance boards. They are just stacked in a corner which I hate but I'm at a loss for what to do with them. We don't have a basement, garage, or utility room to store anything. The toughest thing is the large exercise ball, which we just roll from room to room to get out of the way. Any ideas? I'd love to see a post about this! This is what I've done so far. 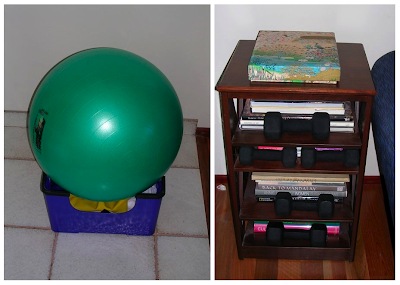 My bands and such get stored in an upside-down exercise step, and the ball balances on top. (A basket could work fine for this, too.) The weights get stored on bookshelves, in front of some books, making sure not to put too much weight on any shelf. If you're ready to move beyond that - and I'm about ready, myself - here are some options. I just now came across The Loop, and I like it a lot. 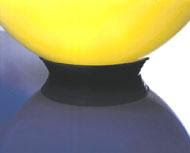 There are a number of companies making ball bases/stabilizers - and prices vary widely. Make sure you get one that's the right size for your ball. Here's another ball holder; you put the ball on the disc, push down, and supposedly create enough suction to hold the ball in place. 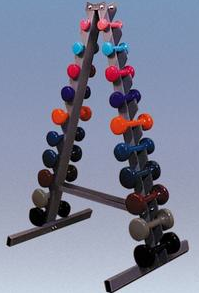 If you have more than one ball, ball stackers are an option to consider. Again, prices on the web vary greatly. They are often sold in sets of three, but you can buy a single one, too. If you want a rack and space is limited, this one from Ideal Products could work - not pretty, but functional. This wall-mounted rack is the most space-saving option I found. 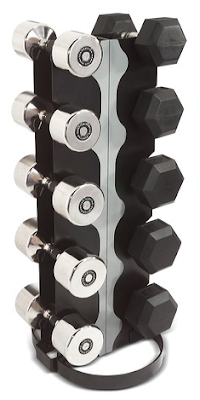 This dumbbell rack is also a space-saver. 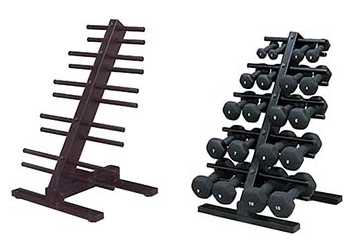 After that, we go on to vertical dumbbell racks; the A-frame is one such style. And there are a lot of vertical racks that look more or less like this one. On a totally different note, there's this weight wagon. 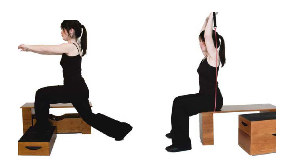 This doesn't address the original question - but I couldn't quite leave the topic of exercise equipment in a small space without mentioning it. The FiTable home exercise system is a weight bench, a cardio step, a rolling storage drawer and a coffee table - all in one. Wow, Sarah - I think it is! That step was something I got second-hand. It has no markings, and I didn't get any of the videos, so I didn't realize I had a Firm Fanny Lifter until just now! Thanks so much for answering my question. There are a lot of helpful ideas and I love "The Loop." Thanks! These are great ideas, Jeri! I have an exercise ball in my laundry room sink as I write this. I'll bet one of those stuffed animal nets would work, too! classiccook: You are very welcome - glad to be of help. Eva: The toy hammock might work - especially if you don't have a cat that can reach it, and thinks it's great fun to swing the hammock. LOL! Yep, I love my FIRM DVD's! You should really check them out if you like to excersize! Sarah, I'm already working with an incredible personal trainer, so I don't need the DVDs. David keeps me quite challenged enough! Brilliant advice! 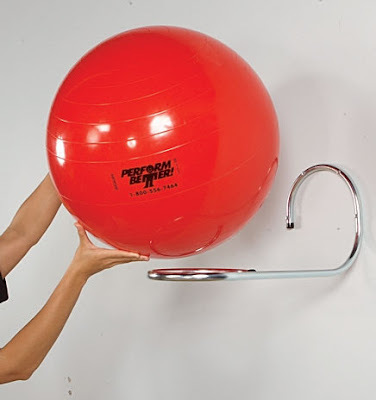 As a GymBall enthusiast I'd like to share this page with my members, with your permission? Chris, of course - as long as you credit me and link back.